A slice is defined as a ball flight that starts out to the left or on target and then spins sharply from left-to-right, ending up right of your intended target. It might seem pedantic, but a slice and a push-slice are caused by two different swing paths. If you hit lots of slices you need to make one type of change to your golf swing – if you hit lots of pushes or push-slices you need to make a different change to your golf swing. A slice (ball starts left of target and curves back too far right) is caused by too much of an out-to-in swing path and not enough hand rotation. A push-slice (ball starts right of target and curves further right) is caused by an in-to-out swing path and not enough hand rotation. Swing 1 imagine the blue lines represent a sheet of glass running through Pete’s body. Notice how the club head would stay in contact with or close to that sheet of glass? This is a good swing plane. Swing 2 in this swing however, notice how the club head would lose contact with the sheet of glass (particularly after picture 2) and would actually smash the glass in the follow through. This swing is too upright known as ‘over the top’. It’s too far in front of Pete’s body. If you’re still having trouble with this in-to-out swing path and really want to get a good feel for it, see this very effective anti-slice drill. 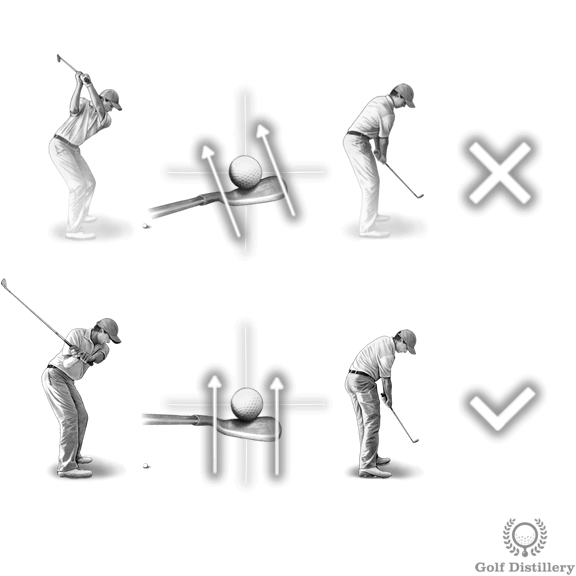 The final step to correct your golf slice involves rotating your hands through the ball. 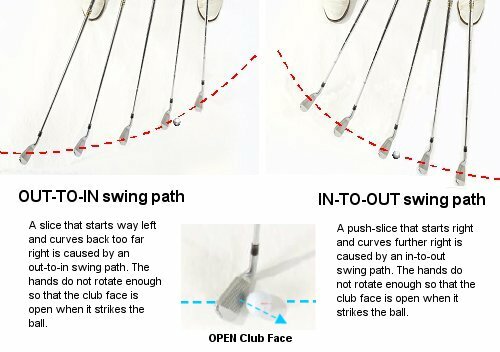 This will prevent an open club face at impact (which imparts the clockwise spin on the ball) allowing you to hit either straight shots or even soft draws. Side Note If you haven’t done so already, visit the anti-slice grip video and article. If your golf grip is overly strong or weak to begin with, you won’t get long-term benefits from the drill above or in the next step of this series.